Chad Ochocinco and Albert Haynesworth are officially Patriots, and now the adjustment begins. FOXBOROUGH, Mass. – It looks like Chad Ochocinco won’t have to change his name again. That was the colorful wide receiver wearing his usual number 85 at practice for the New England Patriots on Friday, one day after being traded by the Cincinnati Bengals. Ochocinco, a reference to the Spanish words for the numbers 8 and 5, legally changed his name from Johnson before the 2008 season. On Friday, he had the number worn last year by rookie tight end Aaron Hernandez, who hasn’t practiced following hip surgery in February. Hernandez was on the field wearing shorts with the number 81. Fans cheered when Ochocinco took the field for the afternoon session. Tom Brady connected on passes to him. Teammates went over play charts with him. The usually verbose Ochocinco didn’t speak with reporters, although the Patriots officially announced the trade for undisclosed draft considerations on Friday, when they also made official the trade for Washington Redskins defensive tackle Albert Haynesworth. Each transaction was confirmed on Thursday by persons familiar with the deals who spoke on condition of anonymity because none of the teams had announced the moves yet. Haynesworth needed 10 days to pass the conditioning test with the Redskins before last year’s training camp. The Patriots did not say why he wasn’t on the field on Friday. Ochocinco joins Wes Welker and Deion Branch in a strong, experienced receiver corps. 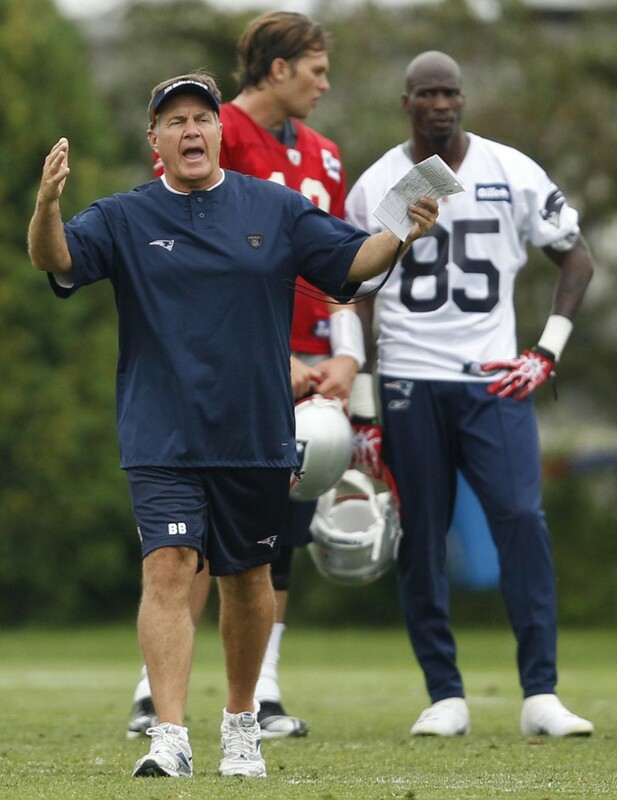 During the walkthrough, a serious-looking Ochocinco spent considerable time talking with Brady and Branch as teammates ran through plays. “I know he’s excited,” Brady said. “He’s excited to be out here and I think he’s excited to be a part of a new team. Brady had surgery in January for a stress fracture in his right foot but participated in three days of voluntary workouts with teammates at Boston College during the 41/2-month lockout. Brady was one of the plaintiffs in the players’ lawsuit against the NFL lockout. That suit was dismissed as part of the settlement on a new 10-year deal. So does Belichick. He has to run practices while assembling a roster. On Friday he released a rookie free agent and six veterans: defensive end Ty Warren, offensive tackle Nick Kaczur, tight end Alge Crumpler, linebacker Tully Banta-Cain, defensive lineman Marcus Stroud, and cornerback Tony Carter. Warren, a starter for six seasons, and Kaczur, a regular for five seasons, spent all last year on injured reserve. Those two plus Crumpler each carried salary-cap numbers of at least $3 million. The Patriots also signed two draft choices: quarterback Ryan Mallett of Arkansas, a third-rounder, and offensive lineman Marcus Cannon of TCU, a fifth-rounder. Haynesworth can be a dominant player but feuded all last season with Redskins Coach Mike Shanahan. And he’s had a number of legal troubles. He last played against Haynesworth in a preseason game before the 2009 season and suffered what the Patriots called a sore shoulder after being crushed to the turf by the 335-pound tackle late in the first half. Brady missed the rest of the game, but played all 16 regular-season games.